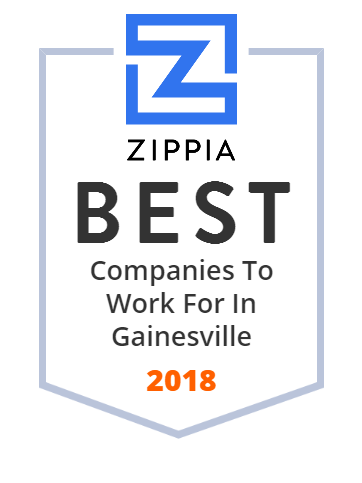 We hand-curated a list of the best companies to work for headquartered in and around Gainesville, FL using data on salaries, company financial health, and employee diversity. Exactech wanted to make a difference in the quality of care provided to patients suffering from joint diseases like arthritis. They develop and produce innovative bone and joint restoration products that help surgeons worldwide make patients more mobile. Throughout the company's development, their purpose has remained unchanged: Exactech exists to help people improve their quality of life and regain their independence if they've been injured or developed arthritic disease. Founded in 1853, the University of Florida (UF), based in Gainesville, FL, is the state's oldest university and a top research institution. UF has more than 50,000 students and 4,000 faculty members and is consistently ranked among the nation's top universities. Its 16 colleges offer more than 100 undergraduate majors and about 200 graduate programs, including education, law, medicine, psychology, and philosophy. Z-Systems specializes in digital audio interface and signal processing products for the recording, mastering, broadcast, and post-production markets. Their interface products are comprised of a variety of sample rate converters to fit different needs and budgets and several digital audio routers, switchers, distribution amplifiers, and format converters. Z-Systems also manufactures signal processing equipment for professional mastering. The company's range of signal processing equipment includes both two-channel and six-channel gear for equalization and dynamics processing. Established in 2011, Prometheon Pharma is dedicated to global health equity. They are developing the first transdermal patches for insulin and other peptide drugs like growth hormone. Some of their products include insulin patch with transdermal technology for needle-free delivery. Prometheon Pharma also has platform technology that also delivers a hair growth product to combat hair loss. Birch helps you learn how to use the reward earning credit cards you own to earn rewards and finds new cards that earn best with your spending habits. Omninox is an edtech startup with a mission to save teachers' time in the classroom by providing them the best online tools and course content. They've built an online assessment creation and grading platform for teachers in Advanced Placement courses. Th platform provides high-quality practice questions for teachers to assign students coupled with a suite of learning tools to make the teacher more productive so they can spend more time with what really matters, their students. OEC Business Interiors is a creativity-led company that brings human insight to business by studying how people work. This company was founded in 1987 with a strong commitment to integrity and simply doing the right thing for their customers, employees, business partners, associates and neighbors. These principles are the foundation of OEC Business Interiors and have helped them become the regional leader in their industry. All Florida Electric is a leading electrical contractor in Gainesville, FL that provides electrical solutions for commercial, industrial, institutional, and medium & high voltage projects. Its clients include hospitals, schools, churches, sports complexes, underground & substation utilities, and prisons. In over four decades All Florida Electric has completed a vast range of projects, from hospital designs to sports complexes. Meridian Behavioral Healthcare is a private, non-profit organization founded in 1960s. With roots in the community mental health movement, they are committed to bring education about mental illnesses and substance use disorders and treatment of those affected to the local level. From developing a continuum of treatment services that are evidence-based for a range of illnesses to participating in their communities as a partner in enhancing the quality of life, it is Meridian's goal to improve the wellbeing and health of their patients and community. Info Tech consists of two core businesses: Info Tech Systems and Info Tech Consulting. Info Tech Systems develop, implement, maintain, and support automated infrastructure construction management and Internet bidding solutions, whereas its consulting business provides statistical and econometric litigation consulting services and support. Headquartered in Gainesville, Fla., Info Tech is a privately-held corporation with more than 250 employees and has been in continuous business since 1977.